Onco-fertility, or cancer fertility, is an on-going issue for women diagnosed with and treated for cancer during reproductive years. 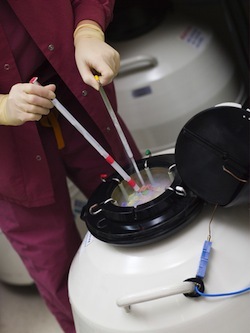 Researchers from the University of New South Wales in Sydney, Australia, recently published a study in the Journal of Assisted Reproduction and Genetics on the possible solutions for women facing cancer treatment. Current practices include vitrification of embryos and oocytes. Vitrification is the processing of freezing that protects tissues from damage by essentially holding the tissues in place. Water is replaced with a cryopreservant before the embryos and/or oocytes are frozen with liquid nitrogen. Researchers note fertility specialists should pay special attention to ovarian stimulation to prevent over-stimulation in cancer patients. Conclusion: With proper care, cancer patients under the age of 36 can participate in fertility programs to harvest and preserve embryos and/or oocytes for later use. Patients over the age of 36 do not respond as well to current fertility practices. Source: Koch J, Ledger W. Ovarian stimulation protocols for onco-fertilty patients. J Assist Reprod Genet. 2013 Feb 17.